Hurry, fill all the bank notes in bags. Let’s get all the notes out and burn them up. Someone asks what to do about coins? Fill them up in a bag and dump it in the pond. This isn’t a bank robbery. This was the scene from a public sector bank in town of Tezpur where all currency notes were being burnt to prevent them from getting in hand of Chinese. This is one of the chilling events from the memoirs of the war of 1962. Today, when the Chinese President, Xi Jinping, returns from India after a hyped up 3 day trip, one is bound to think of what was the outcome of this high level interaction. When the two leaders sat in Hyderabad house, they were representing over one third of world population in single room. There were many agreements and MOUs but it is critical to note that nothing concrete came out in form of assurance for border talks in the Joint Declaration that was issued by both countries at the end of the trip. While the President of the country was welcomed by our Prime Minister who left no stone unturned to highlight significance of the visit, it is to be remembered that the entire visit happened in backdrop of military tensions on Sino-India border with Chinese incursion on Indian territories along three various fronts. This is a reminder of the fact that amidst the attempts for strengthening of cultural and economic ties, it is the border dispute which is major irritant in the relationship which would cast its shadows of progress in any other aspect. Until this is removed, rest of attempts on both sides become cosmetic and superficial veils to cover the real problem. 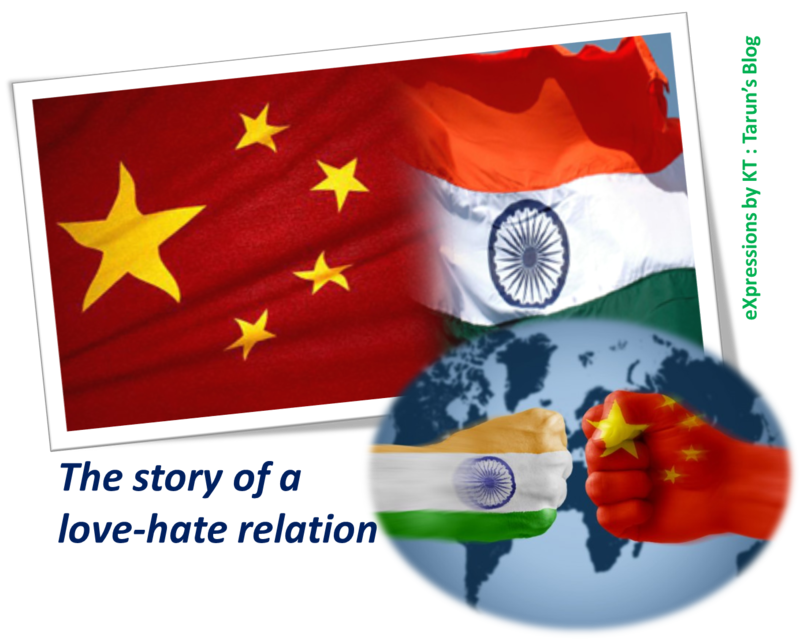 So I decided on to go back to the history to get a glimpse of the Sino-Indian relations over the years and what is the foundation of the border irritants. 1962 is a very important year in the relation of these two most populous countries of the world which left such deep scars which have been difficult to heal even over half a century later. On October 20th of the year, Indian soldiers on the Indo-China border woke up to heavy shelling by the Chinese side which was the start of a one-sided war. Indian Army was heavily under equipped for a war at that time and suffered huge losses. Over a thousand soldiers were killed on Indian side and equally seriously injured with a large part of India and NEFA (now Arunachal Pradesh) captured by China. However, the gravest casualty of the war was loss of trust between the two countries where even in best of the times we call ourselves competitors rather than friends. I remember that during a childhood trip to Sikkim, we were visiting the Nathula Pass where the two sides come at breathing distance. While, the Chinese soldiers came ahead to greet us some of the tourists among us tried to exchange goggles with them. This was politely but sternly objected to by the Indian Security forces with a reminder that though the situation is peaceful today, we have had a long relation of distrust and had three military conflicts. In the run up to 1962, over 15 years of Indian Independence India was struggling with the aftermath of the partition with Pakistan and center of our defense preparedness was Pakistan. Indian leadership was always hopeful of a great neighbor in form of China and this was not without a reason. India got its independence from the British rule in 1947 and China became an independent communist state two years later. India was the second country in the world to recognize the new government in China as official authority and severed ties with Taiwan. However, hardly were our gestures adequately reciprocated. We may blame it on our shortsightedness or their expansionary vision, but the loss is on both sides, even if not of equal magnitude. So what happened in 1950 that the Tibetan leader is talking about? The hand of friendship from India was shunned for the first time 1950 when China attacked Tibet and announced it as a Chinese state. Tibet had till then played a role of buffer between the two countries and once it was made part of China, suddenly the shared border with India increased exponentially. India’s them PM, Jawahar Lal Nehru let it happen in hope that China would not enter India in fear of a potential world war and assessment of incapability of anyone to be able to stop Chinese attack on Tibet. He wasn’t ready to raise the issue of border with China inspite of Patel’s insistence. Nehru through Indian ambassador was assured of Chinese intention of peaceful resolution of Tibet issue and he took Chinese word on it. However, we did not realize then that what was casual attitude of China on the face was simply a calm before a storm. China had never agreed to India’s announcement of McMahon Line as international border as decided in 1914 between a tripartite agreement of China, Tibet and British rulers of India. Though there was a disagreement, Chinese showed no response to the announcement and even kept mum when Indian administration entered Tawang. This definitely left India anxious about Chinese intentions and India’s then ambassador to China was mandated to understand Chinese thought on the boundary and need for deliberations. However, during all his discussions, Chinese never touched the issue and only economic and cultural relations were talked about. Indian ambassador inferred this treatment as silent agreement to India’s position and reported that there was no need to talk border with China. Though this report was contested by many quarters in Indian administration, Nehru agreed to the report and advised the foreign ministry that it was not the time to discuss borders and deferred the topic to later. This probably was the first nail in the coffin of the trust that these countries could have enjoyed for long. Infact, India went ahead to sign the Panchsheel Agreement recognizing peace and tranquility as cornerstone of Sino-India relations. World hailed it as a testimony of two neighboring powers coexisting and slogans of “Hindi Chini Bhai Bhai” became popular. But amidst this, the border issue was put on back-burner where India acquiesced into Chinese claim in Tibet while got no assurance on India’s stand on the border with China. One may say that we did not have option at that time but then we also lacked an understanding of their intentions. While leaders of both side travelled to each other and held discussions but they never talked border. India even refused asylum to Dalai Lama on first attempt. While India was appeasing China, They had prepared road infrastructure to Tibet through Akshai Chin which was India considered its own part. It was then when India woke up and wrote to China indicating India’s position to which we got terse reply that Indo-China border was never officially declared and China did not discuss it just because it was busy with other issues. They then called in for fresh discussions on the matter. Things further worsened when finally asylum was granted to Dalai Lama. Finally Nehru realized that he was wrong in his assessment and agreed that the two nations would have a faceoff for the brazen lands. He responded to this by approving the so-called forward policy – with unprepared units - where India deployed army on the border in NEFA. Chinese considered this as aggressive instance and asked for restrain and respect for line of actual control. This was just an attempt to capture Aksai Chin in name of status quo. Officials and diplomats kept meeting but no solution came in. India despite of tensions supported Chinese bid in UN in 1960. Finally we had the war in 1962 lasting for over a month, which impacted the relations of the two countries forever. This was also followed with two other military conflicts between the two countries. In 1967 there was a Sino-Indian skirmish, also known as the Chola incident, which was a military conflict between Indian troops and members of the Chinese People's Liberation Army in Sikkim, who had infiltrated the area. There was another faceoff between the two countries in 1987 Sumdorong Chu Valley which was third military conflict between the two countries. While both sides tried to move ahead and improve relations but these incidents of history couldn’t be left behind. During Vajpayee’s visit to China as foreign minister, the two sides signed a Declaration on Principles for Relations and Comprehensive Cooperation and also mutually decided to appoint Special Representatives (SRs) to explore the framework of a boundary settlement from the political perspective. During the April 2005 visit of Premier Wen Jiabao, the two sides established a Strategic and Cooperative Partnership for Peace and Prosperity, while the signing of an agreement on Political Parameters and Guiding Principles, signaled the successful conclusion of the first phase of SR Talks though the issue goes unresolved. During Chinese President Hu Jintao’s visit to India in November 2006, the two sides issued a Joint Declaration containing a ten-pronged strategy to intensify cooperation. Today we have a economic relationship which is beyond many magnitudes. When Chinese Premier Wen Jiabao visited India in December 2010, the two sides jointly set a bilateral trade target of US$ 100 billion for 2015. It is noteworthy that more than 60% of the agreements between India and China have been signed during the last decade. As of today, both sides have established 36 dialogue mechanisms covering diverse sectors. Over 16,000 strong Indian community there may be cultural messengers but all this had done little to assuage the apprehensions and suspicions against China in India. Much is still left wanting in this relationship. Today, the joint declaration merely mentions encouragement to the same Special Representative group, which incidentally has remained fruitless until now, without any concrete action plan and timeframe for discussions. This when China still grants residents of Arunachal stapled visas and there are over hundred of incidents of Chinese soldiers entering Indian territories leading to frequent tensions between two strong armies. With this joint declaration in hand, I wonder if we are moving towards a same mistake emphasizing on economic ties keeping border issues on backburner. Or do we take PM at word when he says that all irritants were raised strongly. Or was there a discussion within the rooms to which we are not privy of and which reduced the so hyped $100 bn investment to $20 bn. Whatever was the result, but I hope the border issues are sorted out soon so that these two neighbors move ahead in tandem while being healthy competitors. It is high time that there is an opportunity to move forward from the air of suspicion to ray of hope. What do you think about this relationship? Do you see hope at the end of tunnel or are still apprehensive of Chinese intentions? Pour all your views in comments? And as always reach out to me on mail to have a more focused discussion on the matter.